The ideas, comments and votes shared in the online workshop were analysed to identify themes, key messages, potential barriers and even recommendations. The data were grouped into recurring themes and subthemes. some potential solutions that participants shared as well as good practice cases that is already being implemented (either in Greater Manchester or other regions of the country). It’s worthy to note that 3% of those who answered the snapshot survey questions were discounted from the analysis for living outside of the region. As alluded to earlier, logic would dictate that someone who describes themselves as generally healthy would have lower than average health issues, if any at all, and report no real desire to improve their health. Likewise, those who describe themselves as unhealthy would have a poorer than average health i.e., they would report a number of unhealthy behaviours and/or long term conditions, and we might expect them to report a desire to improve their current context. Yet, such a simplistic logic was not present. Of those who live in Greater Manchester, everyone could be divided into the six groups. 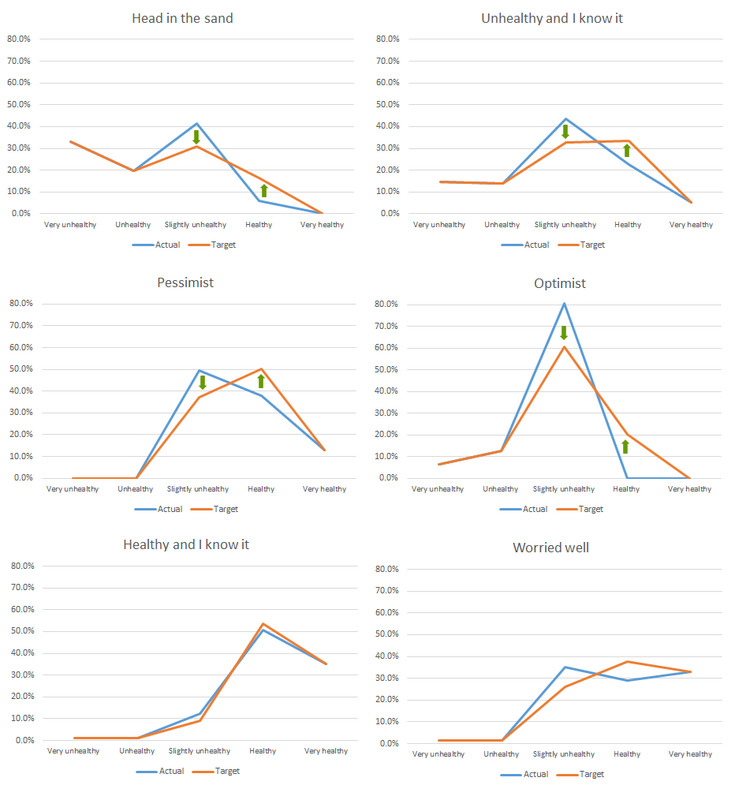 Public knowledge about healthy lifestyles is actually quite high. Indeed, people broadly understand what a healthy lifestyle entails. The reason they are not taking the next step is because their barriers, i.e., root causes, are not being addressed in the design of programmes and interventions. A lack of personal confidence, self awareness and old beliefs keep people stuck. The perception that personal resources are an issue is further undermined by a lack of confidence or awareness (reducing resourcefulness). People feel the environment we live in is “dehumanised” – from failed one size fits all designs, to inaccessible or poor parks and leisure facilities, to unsupportive workplaces. Health and care information and services feel “dehumanised” too – a lack of empathy and connection to real needs with a workforce that is equally as ill as the general public. In short, confidence and perceptions are the biggest barriers to taking charge. Indeed, it seems more than half of Greater Manchester’s people are sacrificing their own health for fear of being judged. This is food for thought that will be discussed in our recommendations for action. Might the “moderately unhealthy” middle be the target for change? 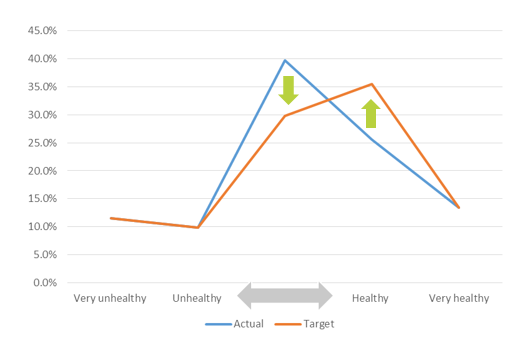 Another key insight in the data is that the “moderately unhealthy middle” be a key target for change. 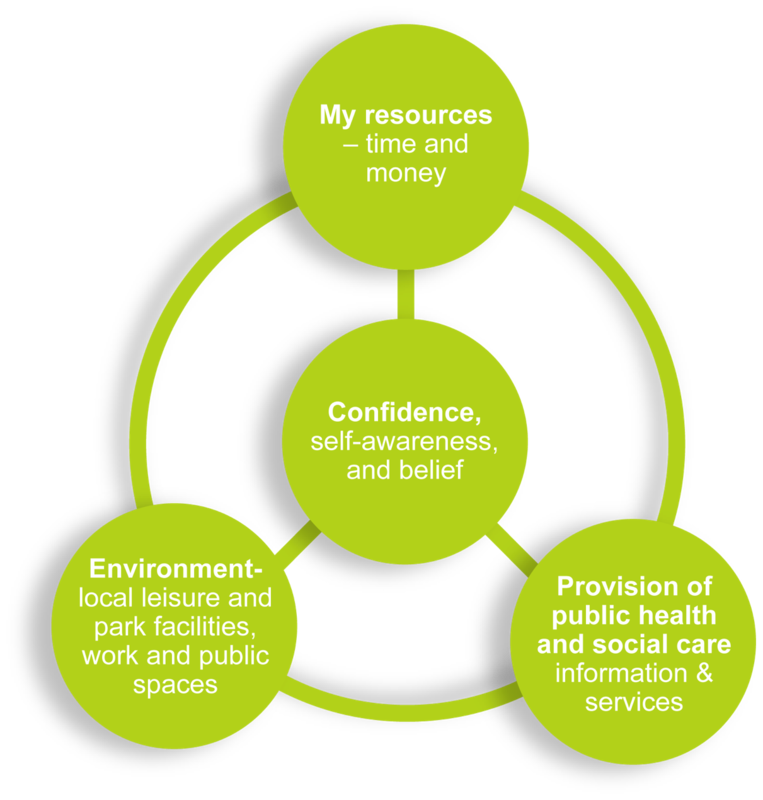 Typically resources across the localities of Greater Manchester are being allocated to help unhealthy people to address their needs. What if our moderately unhealthy middle could be the “persuadable middle”? 39.7% of our snapshot survey sample can be defined as “moderately unhealthy” (with 2-3 unhealthy behaviours or conditions each). a subsequent increase in the healthy, from 25.6% to 35.5%. The graph here illustrates this shift. Might such a change perhaps even initiate the radical upgrade in population health that’s envisioned by the GM Strategic Plan? 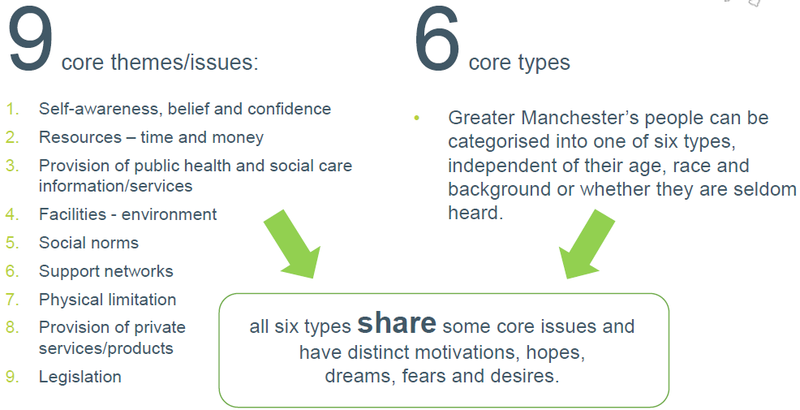 We can apply our new insight regarding the 6 types of people in Greater Manchester to further explore the insight regarding the size of our moderately unhealthy middle population. We learn that a shift in the moderately unhealthy would play out differently across the region’s six types of our people. And we can deduce that prime targets for interventions would be “head in the sand”, “unhealthy and I know it” and “optimists” and now we can be clear that approaches to these groups would need to be different to achieve the goal, or we would need to understand and target a core shared view. This is food for thought that will be discussed in our recommendations for action. How can we take these insights forward – what are our recommendations? Read our Creating Action report here.